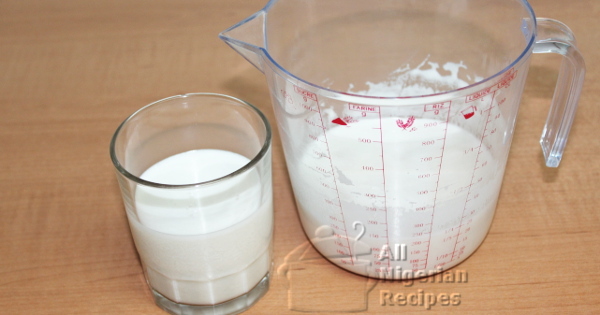 The following procedure is how to make rich concentrated coconut milk perfect as a cow milk replacement for those that have lactose intolerance. This conc. coconut milk is also used for baking and preparing recipes where it is important that the coconut milk is thick. There's a huge difference between normal coconut milk and the very conc. homemade coconut milk. For best results, use very mature coconuts. Very mature coconuts have brown skin, they are very sweet and the shell is brown and dry. Break the coconut into pieces with a blunt object and pry out the meat from the shells. Rinse the coconut meat and cut into tiny pieces. Put the pieces in a blender, add just enough warm water to help the blades of the blender rotate freely. I used 225mls (1&frac18; cup) warm water for 1 coconut. Use this as a guide because all blenders are not the same. If you can blend yours without adding any water, that's the best! Sieve it and squeeze the chaff till dry. Pour through a chiffon cloth (cloth for seiving akamu, cheese cloth) to remove the tiniest particles.